THE Saudi Agricultural and Livestock Investment Company (SALIC) has acquired 200,000 hectares of mixed farming country in Western Australia’s eastern wheatbelt. The deal settled yesterday, and was approved last month by the Australian Government’s Foreign Investment Review Board. The aggregation was put together by John and Julie Nicoletti, who owned and leased some of the properties in the parcel, and includes some land leased or owned by several of the Nicolettis’ neighbours. “It’s all cropping and Merino sheep country,” Mr Nicoletti told Grain Central. Mr Nicoletti said most of the area featured soils ideal for cropping with a pH of 6-7.5pH, and a few pockets with a pH below 5. The country has achieved average yields for wheat and barley of around 1.3 tonnes per hectare, and can produce Prime Hard wheat of minimum 13 per cent protein. Mr Nicoletti said SALIC have kept on some staff who were working on the farms under previous ownership or management, and the company has put on additional staff. “I wouldn’t be surprised if the air seeders are out in the paddock next week. With strong sheep and wool prices, and a pleasing harvest behind him, Mr Nicoletti said the deal with SALIC has come at a good time. The aggregation was listed for sale with Danny Thomas of CBRE, and the closing date for expressions of interest to be submitted was 29 June last year. 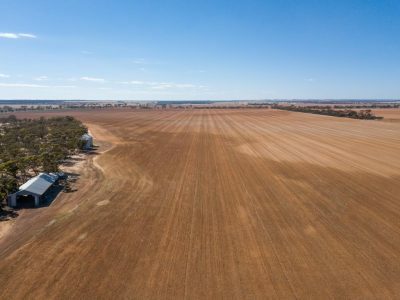 While not the biggest sale by value of cropping country, a ranking which is believed to be held by Boolcarrol and Milton Downs in northwest NSW, the deal with SALIC is believed to cover the biggest area transacted in recent history. Mr Nicoletti said the scale-down in his farming commitments will allow him to spend more time with the Ag Implements John Deere dealerships he owns in the WA wheatbelt. These are located at Cunderdin, Merredin, Mukinbudin, Narrembeen, Northam and Quairading. Saudi Arabia is a long-term and large-volume buyer of Australian sheep and feed barley, and has been interested for some years in investing in mixed farming in Australia. On its website, SALIC’s has said its main objective is to create a series of sustainable agricultural investments in multiple geographic areas that start from agricultural fields and continue with trade and distribution. In January, SALIC acquired both AlMarai and SGAF’s stakes in United Farmers Holding Company (UFHC), which manages 44,000ha of cropping land in west Ukraine which produces wheat, maize, barley and other commodities. SALIC said the purchase of UFHC fitted with its s strategy of investing in specialised agricultural companies as part of the Kingdom of Saudi Arabia’s food-security strategy.